If you have never heard the term, black jack sedum, it may be because this plant is often referred to by its common name, autumn stonecrop. Whether you are knowledgeable about this sturdy plant or just hearing about it for the first time, there is a lot to appreciate about this perennial. What Is Black Jack Sedum? Black jack sedum is a member of the Crassulaceae family. There are over 400 varieties of sedum or stonecrops in North America alone which makes this family one of the most prolific. Black jack sedum was first introduced in 2005 by Walters Gardens Incorporated. The plant grows up to two feet tall and is compact with only an 18 to 24-inch spread. The plant has distinctive dark purplish-black leaves and clusters of bright pink flowers. The plant blooms in late summer and continues flowering into autumn. This late season flowering characteristic is how it came to be known by the common name autumn stonecrop. This type of sedum is sold as a rhizome which is a bare root plant. Since this plant does not spread, you won't need to worry about separating mature plants. You should purchase enough to cover the entire area. If you plan to use the sedum as a border, take into account the 18 to 24-inch spread and plant inside where you want the edge of the border to be. Water when the soil becomes dry for best results. Though relatively low maintenance, you may need to pinch taller specimens in the middle to prevent the center stalk from splitting. Monitor your plants during the early summer months and pinch off as necessary before the plant flowers in late summer. Once the plant finishes flowering in late autumn, you can either cut the plant back or leave the spent seed heads for birds to feed off of over the winter. If you do leave the seed heads intact, make sure to cut them off during the early spring to enable new growth. When the plant is in full bloom, you may want to enjoy the blossoms as cut flower arrangements. To avoid damaging the plant, use garden shears and clip at the base of the individual stem. Take care not to cut the center stalk as this will cause the plant to stop producing flowers. 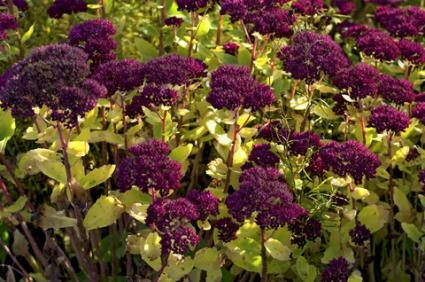 Now that you know more about the black jack variety of sedum, consider adding it to your landscape. Not only will you have a plant that is super easy to care for, you can also improve your local habitat by attracting butterflies. Dried flower arrangements and even fresh arrangements look beautiful when a bit of autumn stonecrop is added.